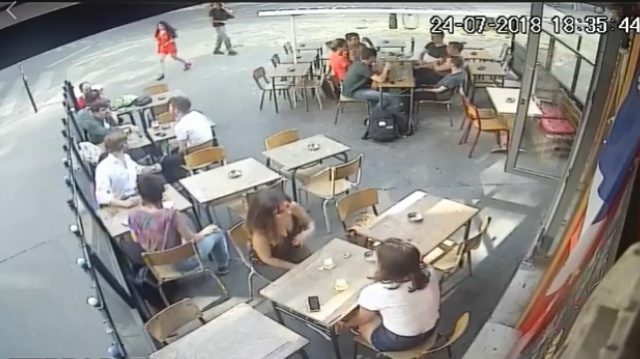 Paris prosecutors have opened an inquiry after a young woman posted a shocking video of a man punching her in broad daylight outside a cafe after she angrily responded to his sexual harassment, legal sources said Monday. Marie Laguerre, a 22-year-old student, wrote on Facebook last week that she was returning home when the man started making lewd comments — “not the first time it had happened to me that day”. She told him to “shut up” and kept walking away, while the man went in the opposite direction. In surveillance video provided by the cafe, the man is then seen grabbing an ash tray from a table on the cafe’s patio and throwing it at her. He then returns where Laguerre confronts him, and strikes her across the face. Laguerre filed a complaint with police and later posted the video, writing that “we must no longer keep quiet”. “Filmed Proof,” the Parisien newspaper wrote in its front-page headline on Monday after the video went viral in a Twitter post on Saturday. “What’s at stake is serious — it’s the freedom of women to move about in freedom in public,” France’s Equality Minister Marlene Schiappa said in an interview with the paper. She said the government is preparing to push through this autumn a law that will punish sexual harassment in public spaces with on-the-spot fines, part of President Emmanuel Macron’s pledge to combat sexism. The law covers behaviour including comments on a woman’s looks or clothing, catcalling, intrusive questions, unwanted following and “upskirting” — taking pictures under a woman’s dress without her knowing. Schiappa also urged witnesses at the cafe — many of whom are seen confronting the man after he punches Laguerre — to help police identify him.